into the President’s office by Prof Yemi Osinbajo, the vice president. Adeboye at the forecourt with Buhari and Osinbajo. Commission, Nuhu Ribadu, in their bid to make him chairman. Working Committee, NWC, under the interim leadership of Uche Secondus. the party by its top echelon”. accept to chair and transform the party. goings on in the PDP said some of the party’s governors visited Mr.
however, said to have stuck to his guns. region began a search for Ribadu, to no avail. attempts to reach him impossible,” the source said. scrambling to reach Mr Ribadu. (DSS) rearrested him immediately after his release from Kuje prison. Tuesday that the prosecution was ready for trial to commence. defendant enjoys his constitutional rights,” he said. prosecution has not enabled him to enjoy his constitutional rights. “The worst is that for about seven weeks we do not know where he is. adjourned to March 3 for hearing of a motion to discharge Dasuki. territory (FCT) high court, Abuja. of Power, Works and Housing, a Daily Trust analysis has revealed. The ministry has N433.4 billion total sum for the capital projects of the ministry and some agencies under it. The main ministry’s capital budget is N334.3 billion, NREA N15.3 billion, TCN N50 billion and FERMA N25 billion. Electricity Liability Management Limited, N2 billion. allocated N2.9 billion; North-East has N9.4 billion. The analysis showed that the Federal Capital Territory (FCT) Abuja brought up the rear with N926.7 million of the total sum. International Airport road in Lagos State N5 billion. electrification scheme in 9 communities in Kaduna State N306 million. The incident happened at Ajegunle, a suburb of Lagos State, western Nigeria. in Lagos State, western Nigeria, and carted away valuables. Adisa was reportedly caught and searched while the robbers were escaping and was found with some stolen items. they handed him over to them. Enijore and stole the N10,000 he kept in the house including a wrist watch and necklace. The residents first recovered the items before one of them used a sharp cutlass and cut off Adisa’s arm. But as he was about to cut off Adisa’s leg, the police arrived the scene and rescued him. Adisa was brought to court on Monday with his right hand covered with bandage and when he was arraigned, he pleaded not guilty. The presiding Magistrate, Mr T.A. Aborenwa granted him bail in the sum of N50,000 with one surety in like sum. He was ordered to be remanded in custody pending when he will perfect the bail. Adisa was taken back to police custody pending when the report will be ready. for delivering the judgment was not convincing. foreign affairs, reportedly videoed the girl while the action lasted. Zouhoura Mahamat Brahim Ali was raped by some sons of army generals. they raped her while she was crying and begging them not to do so. are influential in the society. A former governor of Borno State, Ali Sheriff, has been named the new chairman of the Peoples Democratic Party. on the choice of Mr. Sherffi, who is also a former senator. ratification before a formal announcement would be made. Labour Congress (NLC) has rejected the proposal. want to see fly in this circumstance. the unified pension fund scheme was established. mismanagement inherent in public sector institutions in Nigeria. politicians famous for their careless handling of public funds. pauperising us at the slightest opportunity without any conscience. managed by the PFAs under the advisory of PENCOM. estimated to be upwards of 40 per cent. service delivery by the power companies is unacceptable. which kicked in on February 1.
factors hindering the optimal functioning of the power sector. support, we do not need to add to the suffering of the people,” he said. LOKOJA – Speaker of Kogi State House of Assembly, Momoh Jimoh Lawal has been impeached. the House like a sole proprietor. not pass under a sane atmosphere. a.k.a I Go Dye will be embarking on a world tour. Standing to other European cities also to America,Canada and Asia. his fans for the love and support since the past two decades. Akinlolu JEKINS & Co/Cococure APP. Yet again, the federal government has sacked the heads of 24 federal agencies and parastatals. The sacking of the DGs was made known by Babachir Lawal, the secretary to the government of the federations. FG had earlier announced the sack of the heads of the six information-related parastatals under the ministry of information and culture. The affected agencies includes, Nigerian Television Authority (NTA), Federal Radio Corporation of Nigeria (FRCN), Voice of Nigeria (VON), News Agency of Nigeria (NAN), National Broadcasting Commission (NBC), Petroleum Technology Development Fund (PTDF), New Partnership for Africa’s Development (NEPAD), Nigeria Social Insurance Trust Fund (NSITF). READ ALSO: EFCC investigating 7 army generals over arms scandal Others are: Nigerian Content Development and Monitoring Board(NCDMB), Federal Mortgage Bank of Nigeria (FMBN), Tertiary Education Trust Fund (TETFund), National Information Technology Development Agency (NITDA), Petroleum Equalization Fund, Nigeria Railways Corporation (NRC), Bureau of Public Procurements (BPP), Bureau of Public Enterprises (BPE). Petroleum Products Pricing Regulatory Agency (PPPRA) Standard Organization of Nigeria (SON), National Agency for Food and Drugs Administration and Control (NAFDAC), Nigeria Investment Promotion Council (NIPC), Bank of Industry (BoI), National Centre for Women Development (NCWD), National Orientation Agency (NOA), Industrial Training Fund (ITF), Nigerian Export-Import Bank, National Agency for Prohibition of Traffic In Persons and Other Related Matters (NAPTIP). 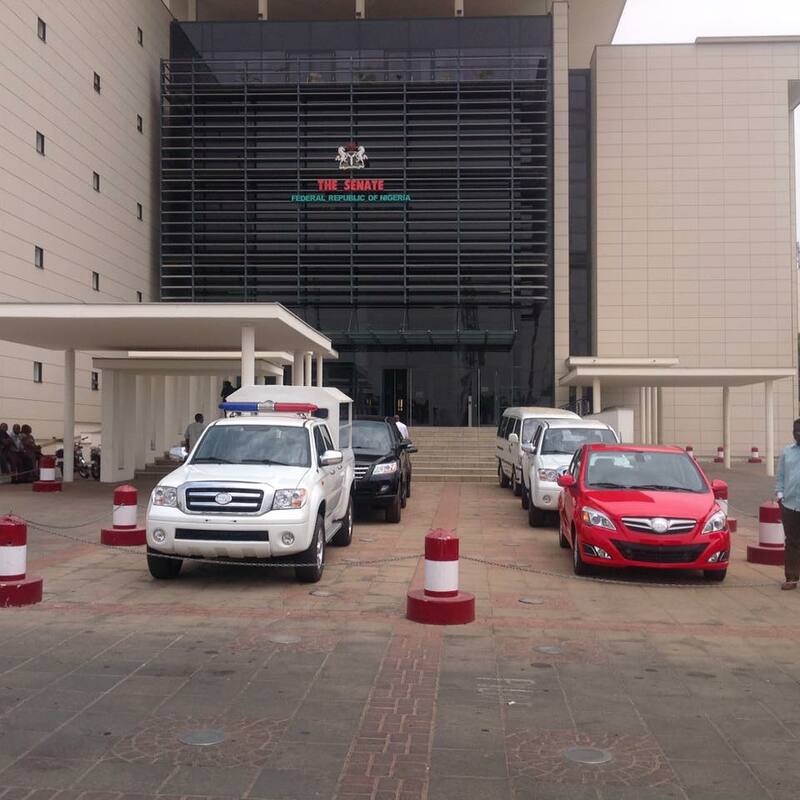 The local car manufacturers, Innoson motors cars were spotted at the senate car park of the National Assembly on Monday, February 15. The cars spotted at the car park were six in number which include a jeep, a van and other salon vehicles. At the Made in Aba trade fair which took place at Area 11, Garki Abuja on Monday, February 8, Cornel Osigwe, the Spokesman of Innoson Motors revealed that the company would try to get the National Assembly to acquire its cars as its official car. “Government’s recognition of Innoson and the likes, will act as an endorsement for the brand. “It can also boost patronage from Nigeria and other African countries,” he said. READ ALSO: Photo and video of Saraki at the Made in Aba trade fair The patronage granted by the National Assembly is to promote locally made products in Nigeria as part of plans to diversify the economy. The trade fair was facilitated by Senator Ehinnaya Abaribe representing Abia south senatorial district, who Saraki eulogised for his foresight in organising the event. The NASS correspondent at Naij.com were able to take spme pictures of the vehicles. See more pictures below. The cordial relationship between Nigeria and neighbouring countries in the fight against Boko Haram is yielding fruitful result. The commander of Cameroonian 1st Battalion has handed over two suspected Boko Haram terrorists to Nigerian troops. Share on Facebook Share on Twitter Troops demining of a section of the road between Kirawa Junction to Pulka Troops demining of a section of the road between Kirawa Junction to Pulka The commander, who paid a courtesy call on his counterpart, the Commanding Officer of 121 Task Force Battalion in Pulka, assisted in demining of a section of the road between Kirawa Junction to Pulka. READ ALSO: Boko Haram: We are bringing the war to conclusion – army Eight men, 36 women and 68 children were also rescued in the area. Share on Facebook Share on Twitter Some rescued pesons and their personal effects Some rescued pesons and their personal effects This was disclosed by Colonel Sani Kukasheka Usman, the acting director army public relations. However, one of the visiting unit’s vehicle ran into an Improvised Explosive Device (IED), buried along Pulka-Ngoshe road. A Cameroonian officer lost his life while eight soldiers sustained injuries. Share on Facebook Share on Twitter Mine clearance by the troops Mine clearance by the troops “Also, troops of 113 Battalion on patrol to Ngwala cleared Boko Haram terrorists’ camps at Ngorta and Aritimie villages. “The troops also came across the terrorists market at the area. However, on sighting the troops the suspected Boko Haram terrorists ran and abandoned their supplies. “The patrol also conducted cordon and search operations around Ngwala and recovered 2 pick up vehicles and 12 motorcycles belonging to the fleeing Boko Haram terrorists. The market has been closed indefinitely,” Usman disclosed. Share on Facebook Share on Twitter Some of the persons rescued from Boko Haram Some of the persons rescued from Boko Haram According to him, the troops are more determined to destroy Boko Haram terrorists and clear them from wherever they may be in the north eastern part of our country. Two days ago, Usman had said the army was making tremendous progress in the fight against insurgency. He disclosed how Boko Haram enclaves were cleared, five IEDs detonated by the troops and an IED manufacturing workshop destroyed. Some days earlier, Cameroon soldiers killed at least 27 Boko Haram fighters after launching a cross-border operation in the Nigerian locality of Goshi. contract based on an uncalculated estimate. wondered why such an act was perpetrated by the handlers of the project. permanent way within the FCT. He wondered why the 60.67km project was later reduced to 45. 245km without reduction in its cost. from N127.53 per dollar last week. excluded from the official market. Offences Commission(ICPC) for investigation, a source said last night. Democratic Party’s (PDP’s) presidential campaign. Some of the former chief executives also awarded contracts to cronies. Nigeria Social Insurance Trust Fund (NSIT), among others. under various stages of investigation. The source gave an insight into some of the infractions. workers will not want to see fly in this circumstance. fund scheme that the unified pension fund scheme was established. fund is managed by the PFAs under the advisory of PENCOM. his new mistress to their matrimonial home. saying she is always beautiful. inspired by Olajumoke, we’d love to move her forward. Payporte said: We are glad to announce the signing of @Olajumoke__o (Bread Seller turned model) as “Face of PayPorte 2016”. We will be featuring Olajumoke on our billboard campaigns through the year 2016.
birkin bag is a very expensive and high end designer bag by Hermes. Kardashian is even reported to have waited years to get a birkin bag.